Looking for the best local Property Service Specialist? CONROY PROPERTY SERVICES is the solution! Licensed 30+ Years of Experience! Click to Schedule Appointment Now! Welcome to Conroy Property Services where we put you, our valued customer, as our number one priority in all that we do. Our company, CPS (Conroy Property Services), has been locally owned and operated here in Naples Florida since 1986. We have seen many changes in that time, but the one thing that has never changed is our commitment to you, our valued customer. We not only work in the area, we reside alongside you. We hear every day what is important to you, and what you value the most, GREAT service. And that is exactly what you will get from our company each and every time. We offer a wide variety of services to our clients, many of which are unique and unequaled. These services all include NO-pressure cleaning. That’s right, NO pressure. Our system is gently sprayed on your desired surface with no pressure application. Gentle to your tiles, regardless of which type you may have. And the results are INSTANT! Once we have completed your application, your entire surface area is sparkling clean, bacteria and mildew free, and looks great!. 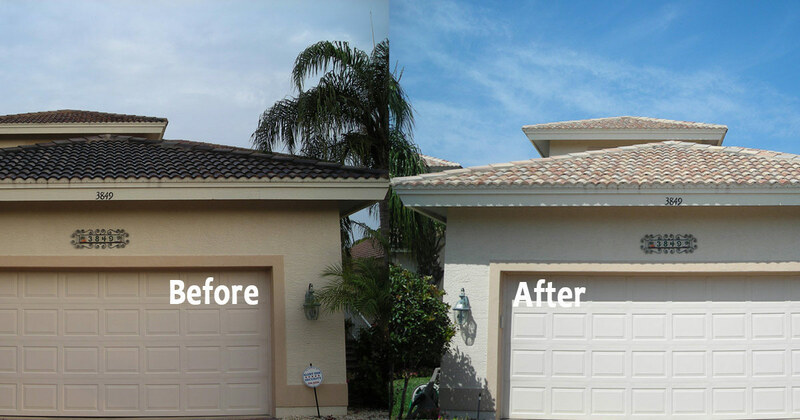 All without any damage that pressure cleaning does to your roof. We clean all exterior surfaces of your home the same way. Pressure cleaning has become antiquated. Why? Because it is damaging and detrimental to every surface it is applied to. Not with CPS. Our patented solution is applied to your home under no pressure and instantly dissolves any dirt, grime, mold or mildew stains that may be there. The end result is a beautiful home, sparkling clean, with absolutely no damage. None! Don’t ever have your home pressure cleaned again. It destroys paint, soffits, screening and protective coatings. Every time you pressure clean, your home will become dirtier faster and faster each time. Why? Because the protection on the surface has been blown away! Not with our NO pressure application. Not only is your home sparkling clean, it also applies a protective coating that helps to keep your homes finish clean and beautiful for years to come. How About Patio decks, Pool decks, Driveways, and Walkways? Are they looking dirty? Black with mold, mildew? Just lost all of its original luster and sparkle? If so, we can safely clean all of these areas for you also. So whether it is your Roof, homes exterior, patio, pool deck, screen enclosure, driveway or walkway, we can take care of it all for you. Our application is completely safe for any type or style of Roof or Home, and best of all, the results are INSTANT! There’s no waiting weeks or months to see results, and there are no binding contracts that lock you into a service call every six months like so many other companies try and do. They do that because their application is subpar, and they know that unless they lock you into a contract, you won’t be back. Not with CPS. After you see how great your Home looks after our application, you will be calling us every time you have a need. Our only contract with you is one for great service at a great price. Guaranteed. Call us today (239) 249-5290 for your Free, no obligation estimate of your home. We guarantee that once you have had your home cleaned by us, you will never have it cleaned by any other method again. Conroy Property Services…… Excellence in service and satisfaction guaranteed. You can also request an online appointment for a FREE estimate.